Renovate 3 (liquid) Aquatic Herbicide is labeled for control of submersed, emersed and floating plants in and around aquatic sites such as ponds, lakes, reservoirs, non-irrigation canals, ditches, marshes and wetlands. Renovate 3 (liquid) Aquatic Herbicide carries no restrictions on recreational use such as swimming and fishing, or on livestock consumption of water from the treatment area. 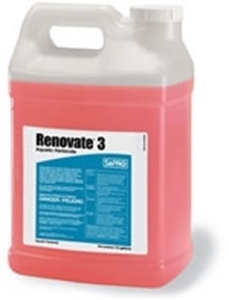 Renovate 3 can be used near active potable water intakes. Please see labels for specific precautions. Sold Individually, Case Qty. = 12 x 1 Qt.